Cytochrome P450s were first identified in 1958 (Klingenberg 1958 and Garfinkel 1958) from their spectral properties. At this time they have been found in all living organisms, from bacteria to animals and plants. They are involved in a vast array of reactions (eg. hydroxylation, isomerization, epoxydation, N-dealkylation, cyclization) in many different pathways (eg. hormone metabolism, secondary metabolism, biopolymers). 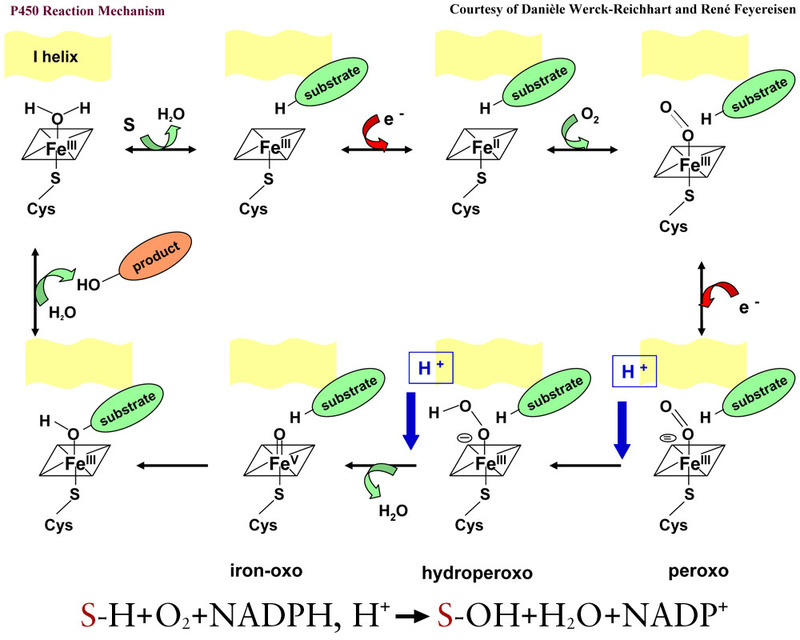 They are hemoproteins, and require a Cytochrome P450 Reductase to transfer electrons from NADPH to their substrate. 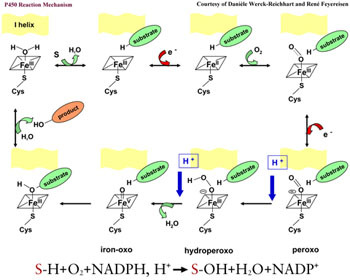 Please see the reaction mechanism below. In Eukaryotes, P450s are membrane-bound and primarily located in the Endoplasmic Reticulum. They often catalyze a specific reaction on valuable products, and are becoming more and more attractive for biotechnologies. Due to their crucial role in drug metabolism, they are well-studied in humans. Please read the introduction to the PDF-file alignments for information on alignment parameters and specifics. This multiple alignment was made with ClustalX 1.83 for Windows. An alignment of 157 P450s from different organisms. A table listing the non-Arabidopsis P450s and their sources. All phylogenetic trees were made with ClustalX 1.83 for Windows (1000 boostrap trials) or MEGA 3.1 for Windows. A phylogenetic tree of the A-type alignment presented above. An unrooted phylogenetic tree of the A-type alignment presented above. A phylogenetic tree of the non-A type alignment presented above. 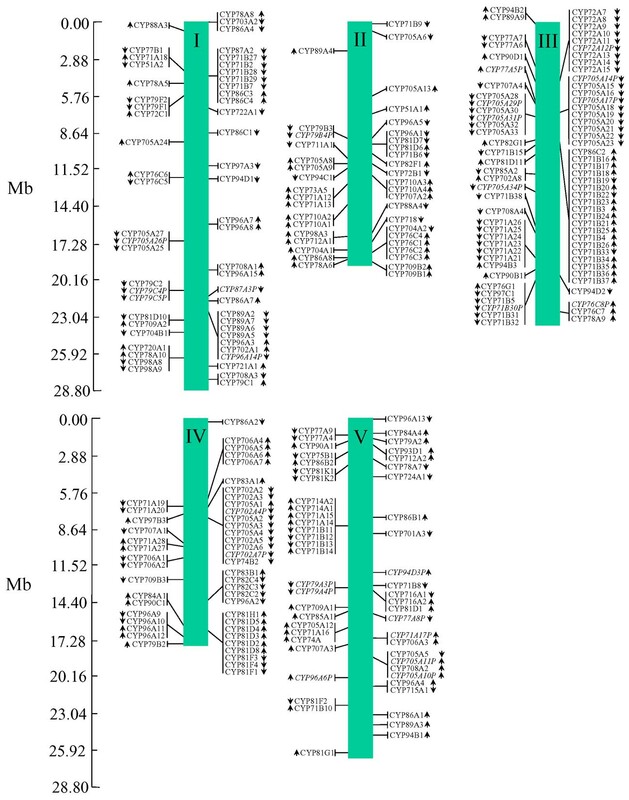 An unrooted phylogenetic tree of the non-A type alignment presented above. A phylogenetic tree of all of the P450s in the complete 246-member alignment. This phylogenetic tree was made with ClustalX 1.83 for Windows32 (1000 bootstrap trials). A multi-organism tree of the alignment presented above. Logos were made using weblogo.berkeley.edu. A logo of the heme-binding region of all full-length Arabidopsis P450s. A logo of the I-helix region of all full-length Arabidopsis P450s. A logo of the K-helix region of all full-length Arabidopsis P450s. A logo of the PXRX motif of all full-length Arabidopsis P450s. There are currently 1932 P450 ESTs over 39 gene families and 67 gene subfamilies in TAIR's Arabidopsis EST dataset. These ESTs were identified via BLAST using NCBI's blastall for the Windows 32 platform. The P450 EST dataset is available on our local BLAST site as a searchable database. Click here for a table of the Arabidopsis P450s that do not currently have ESTs listed in GenBank. Click here for a PDF-graph showing the number of ESTs for each Arabidopsis P450 Family represented in the TAIR EST dataset (39). Click here for a PDF-graph showing the number of ESTs for each Arabidopsis P450 SubFamily represented in the TAIR EST dataset (67). The EST dataset was last updated September 10th, 2004. All P450s have links to the NCBI record for their ESTs on their individual pages. The genetic chromosome maps were made with marker information from Stanford University's Arabidopsis thaliana database, which now resides at the TAIR site. The chromosome sizes and the scale in cM were taken from this webpage. Cytochromes P450 were located on a BAC, YAC, or P1 clone, and the nearest Lister and Dean RI marker to this clone was located using the Illustra Database's genetic maps. The base-pair maps were made by obtaining the complete chromosomal sequence from NCBI's website, creating a BLAST database from them, and searching with the current P450 database against these chromosomes. Positions are based on start codons.